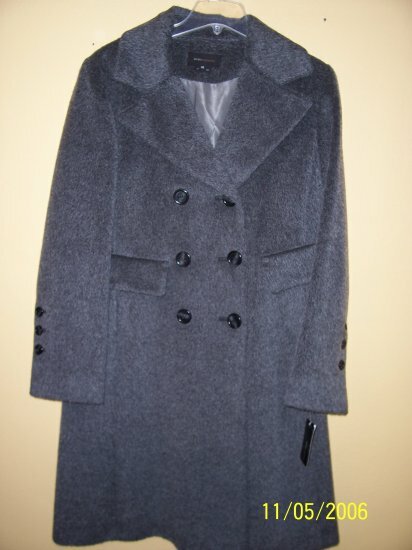 This classic mohair coat has slightly padded shoulders. The cut is traditional double-breasted style, with three actual functioning buttons and three decorative buttons down the front. There is also a hidden button on the inside to help this coat keep its shape and help to further "bundle you up". There are two faux front flap pockets on the front, with the actual angled pockets sitting below the flap of the faux pocket. There are three decorative buttons at the bottom of each sleeve. Finally, there is a long vent in the back that will provide ease while walking, getting in or out of your car, etc. You can't miss with a coat like this! It never goes out of style and it matches EVERYTHING! Please note that this coat is a "Dry Clean Only" item, low moisture, steam press. This BCBG Max Azria coat normally retails for $625, but now you too can own a genuine BCBG at a fraction of the price! You can't afford to let this one pass you by! Buy it for yourself, or start your Christmas shopping early and grab this Max Azria item for that special girl/woman in your life. I sell only 100% authentic merchandise that you would find in higher-end department stores. You will be more than pleased with the quality and design of all of the products I sell. Be sure to check them all out at my store, TOPNOTCH4LESS.